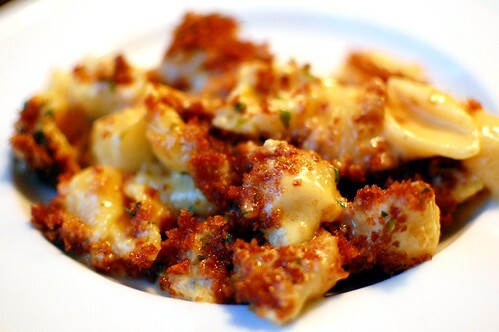 I'm always up for a new mac and cheese recipe, especially a classic like this. If it's a CI recipe AND Josie-approved, I'm guaranteed to love it. Can't wait to try this! I agree with the grainy cheese sauce comment-hate that! Yours looks delicious and creamy! I love the crunchy topping on mac and cheese, and the fact that you can make this ahead is even better! I love a good mac and cheese recipe. This one just looks fab. It could be an entire meal instead of a side! Great party dish, perhaps? Uh oh - looks like I'll be trying this one! It's my favorite food, and this is your favorite all-time recipe, I must try it! The cheese sauce to noodle ratio is kinda freaking me out right now, but I trust that all will bake up wonderfully tomorrow. Hmmmm, the sauce is divine! Looks delicious! Have you tried this with all cheddar by any chance? (I have 2 lbs in my fridge!). I don't think it would work as well with all cheddar - it doesn't melt as well as Monterrey Jack, so the sauce would probably be grainy. I made this for my son's 1st birthday party this weekend and it was a HIT! Parents and kiddos both loved it. This is my new go to mac & cheese recipe. Thanks for sharing. Thanks Josie! Guess I'll wait until I have all the right ingredients. Josie, I made your mac and cheese for dinner tonight. It was my first homemade mac and cheese your recipe is fabulous! I was worried my Velveta loving husband would have issues with homemade mac and cheese, but he loved it. Thank you so much!! Hi! This looks delicious! So if I am making this ahead i would not bake it until the day of, right? Thanks so much! Jess, that's right. Just prep up to the point of baking, then cover and chill until you're ready to bake it. Hope you enjoy! I've attempted more mac and cheese recipes than I would like to admit, all of which have been edible, but not what I was looking for. This one did it for me. The search may in fact be over. Thanks for the stellar recipe!